The Syllabus, Northwestern's yearbook got it wrong, labelling the event as the "Draft Rally." 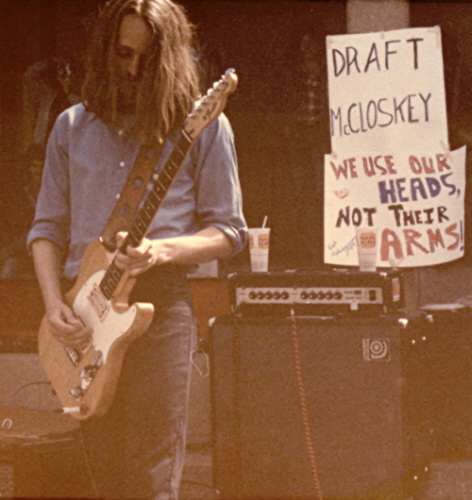 In fact, it was a rally against a peacetime draft that had been proposed by California Republican Representative Paul McCloskey. Actually, it was part of H.R. 2206, entitled "A bill to establish a National Service System under which the young people of the United States shall have the choice of either entering voluntary military or civilian service or being subject to induction into military service by random selection." The bill was supported by Illinois' own Paul Simon (in the House of Representatives at the time) and liberal Patricia Schroeder of Colorado. Frank Zappa wrote a song mocking those against the draft. The chorus was "I don't wanna get drafted/Waaah, waah, waah, waah." There is a case to be made that a draft is a more democratic method of staffing the armed forces. It might be more equitable than an all-volunteer army, but I think the "chicken hawks" who got out of Vietnam service showed it wouldn't be too equitable for the powerful. On the other hand, a peacetime draft implies a war footing. But mainly, it wakes up the young people who might get drafted, and gives them something to rebel against. By the way, the bill never went anywhere. The highlight of our set (if I do say so myself) was the Star-Spangled Banner. It was only a decade after the Hendrix version, and it seemed the perfect choice for the event. But it was not the perfect performance by any means. I didn't even have a tremolo (whammy) bar - I was playing a Telecaster, and hadn't purchased the Strat yet. I learned the melody and did my best with the bombs and sound effects, but I wasn't that impressed myself. But the crowd was into it because of its appropriateness. Plus the concert was free, outdoors on a beautiful May Saturday, and there were hundreds of people there. 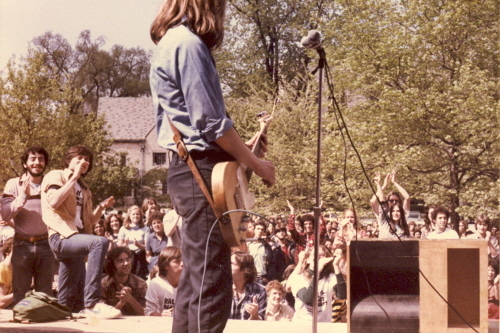 The Lines at the Rally Against the Draft, Northwestern University, May 12, 1979. The crowd reacting to The Star-Spangled Banner.